It’s a special time in my hometown this weekend. We like everyone in the U.S. will have a three day holiday since Monday is our nation’s Memorial Day. Memorial Day is a day set aside to remember the veterans who have died in past and present wars as well as our loved ones who are no longer with us. It is not all solemn as stores will offer deep discounts this weekend and the weather will result in outdoor cookouts, picnics and just plain fun. 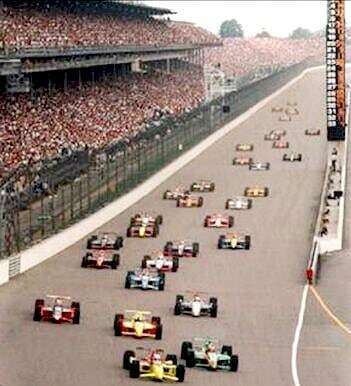 Here in Indianapolis we will be hosting the annual 500 mile race at the Indianapolis Motor Speedway on Sunday. It has been called the greatest spectacle in racing and there will be about 300,000 fans in the stands. That’s right, there will be more people in attendance than live in the country of Iceland all sitting together as they watch the cars race at speeds of well over 200 miles per hour. Audiobook Month – I refuse to limit my listening to books to only June, I keep at least 6 unabridged books on my IPod at all times and listen to them in the car as I drive from hither and then on to yon. It makes the drives seem so much shorter even when I purposely choose long cuts instead of short cuts. Drive Safe Month – My accidents have never been my fault, it has been the fault of the people I run into, if they would have stayed home nothing would have happened. That notwithstanding I will keep driving defensively attempting to avoid both fixed and moving objects. Fresh Fruit and Vegetable Month – This is one of my favorites, almost all the farmers markets will be open this weekend and then every weekend throughout the summer. Yippee fresh real food, don’t you love it! People Skills Month – We all need this one, let’s all hate less and love more! Rose Month – Rose worked for me many years ago, I did not know she had her own month. I wonder how she is doing. Vision Research Month – If I can find my glasses I’ll start the research, if I can’t then sorry I’ll have to wait for the audio book. • In the event of a sudden loss of cabin pressure, masks will descend from the ceiling. Stop screaming, grab the mask, and pull it over your face. If you have a small child traveling with you, secure your mask before assisting with theirs. If you are traveling with more than one small child, pick your favorite. • Weather at our destination is 50 degrees with some broken clouds, but we’ll try to have them fixed before we arrive. Thank you, and remember, nobody loves you, or your money, more than Southwest Airlines." • "Your seat cushions can be used for flotation; and in the event of an emergency water landing, please paddle to shore and take them with our compliments." "You know that old saying, ‘Strike while the iron is hot?’ Well, I think that’s a pretty dumb saying, ’cause I’ll betcha a cold iron will hurt like hell, too." 5. You’re using your cellular phone to dial up every bumper sticker that says: "How’s my driving-call 1-800-***-." Well, she wasn’t the type to chat with strangers in highway comfort stations, and she really don’t know quite what possessed her, but anyway, she answered, a little embarrassed: "Not bad." The stranger said: "And, what are you up to?" Talk about your dumb questions! She was really beginning to think this was too weird! So she said: "Well, just like you I am driving east?" About then she heard the stranger, all upset, say: "Look, I’ll call ya right back, there’s some idiot in the next stall answering all the questions I’m asking you. Bye!" Coming out of church, Mrs. Peterson asked her husband, "Do you think that Johnson girl is tinting her hair?" "I didn’t even see her," admitted Mr. Peterson. "And that dress Mrs. Hansen was wearing," continued Mrs. Peterson, "Really, don’t tell me you think that’s the proper costume for a mother of two." "I’m afraid I didn’t notice that either," said Mr. Peterson. "Oh, for heaven’s sake," snapped Mrs. Peterson. "A lot of good it does you to go to church." Mr. Peterson, a tourist from Toronto arrived in Florida. In an airport taxi cab, Peterson asked the driver…"Say, is this really a healthful place?" "It sure is," the cabby replied. "When I came here I couldn’t say one word. I had hardly any hair on my head. I didn’t have the strength to walk across a room, and I had to be lifted out of bed." "That’s wonderful!" said the tourist , "How long have you been here?" Just being yourself is often the greatest act of courage of all. I had a productive day yesterday as I got my brain scan done, it is not one of my favorite tests. I should know the results next week. I thought that was all the tests for this week but my Neurologist decided she did not want my Neurosurgeon to have all the fun so she has me getting a carotid artery doppler exam on Friday as a follow-up to last summer’s stroke. Fortunately it is only an ultrasound procedure so no needles, IV’s or the dreaded contrast dyes used in the brain scans. I liked it a little better when my human interaction did not include as many white coats. Of course I know I am fortunate that they are there and that they care so much, many have become friends and we always have fun together. A couple of times in the past month or so I shared with you some items off a life’s lessons list a friend sent me years ago. Here are a few more with my thoughts added. No one is in charge of your happiness except you. – It took me awhile to learn how really true this, my life is mine and it is up to me to use it wisely. What has surprised me is how in the years when I was a little grumpy I met a lot of grumpy people, it is funny how they all changed when I became a happier person. Frame every so-called disaster with these words: "In five years, will this matter?" – I don’t even think you need to ask yourself about five years, in my case most often when I ask if this will make any difference tomorrow the answer generally has been, “not really.” In the same spirit I find that if I lose something I care about and I ask myself if the world will end because I did, the answer is always no, so I forget what I can’t change and just move on. Forgive everyone everything. – Not always easy but really worth it. I don’t want what they do to bog me down, it’s just not worth it. Iif they are frequent pains all I have to do is walk away forever. Time heals almost everything. Give time time. – I spent a major part of my life as a trouble shooter which meant that folks could hand their problems off to me, in the process I learned that problems were easier to solve the next day. Fortunately the things we think are big problems really are not that big. The ones that are truly significant are not as debilitating if we take some time to let them mellow while we do some personal character building. If you’re bidding on a job for UPS, don’t send your bid by FedEx. If your computer says, Printer out of Paper," this problem cannot be resolved by continuously clicking the "OK" button. When the PC says, "Insert diskette #2," don’t do it immediately. Remove disk #1 first, even if you’re sure you can make them both fit in there. If you’re in the armed services, and it’s April 1st, and you get an e-mail message to call Colonel Sanders for new orders, don’t. If you go to the computer store to buy a mousepad, you don’t have to specify whether it’s for a Windows or a Macintosh. A big executive boarded a New York to Chicago train. He explained to the porter, "I’m a heavy sleeper, but I want you to be sure and wake me up at 3:00 am for the stop in Buffalo. I don’t care what I say, you just make sure I get off in Buffalo." The next morning the executive woke up in Chicago. He was furious. He found the porter and really gave him an earful before hustling off to purchase a return ticket. Whenever I travel by plane someone always says, "Have a safe trip." Since when does a safe plane flight become my responsibility? I’m not even sure what I’m supposed to do! Go kick the tires, drug test the pilot, what? I feel I’m doing my part by not going up to the cockpit every five minutes and asking, "Are we there yet?" A journalist assigned to the Jerusalem bureau takes an apartment overlooking the Wailing Wall. Every day when she looks out, she sees an old Jewish man praying vigorously. So, the journalist goes down and introduces herself to the old man. She asks, "You come every day to the wall. How long have you done that, and what are you praying for?" The old man looks at her sadly. "Like I’m talking to a wall." The man said, "You don’t understand. I need a card that covers BOTH events! You see, we’re celebrating the fifth anniversary of my wife’s thirty-fourth birthday…"
As the storm raged, the sea captain realized his ship was sinking fast. He called out, "Anyone here know how to pray?" "Good," said the captain, "you pray while the rest of us put on our life jackets – we’re one short." “We all dream a lot – some are lucky, some are not. I can’t stop and talk right now I am off to the hospital to let them see if they can find anything in my head, it will be a day or two before I get the results. If I am done in time I also will be going to a meeting so let me send you what we wrote five years ago today. "The harder I practice, the luckier my game gets." 5. I canceled the Tahiti reservation. Have you noticed that other people have the luck while think we don’t? If the truth be told we all can be lucky if we are ready for it, recognize it, and accept it. I consider myself truly lucky for being allowed to do the things I have done, met so many good people along the way, being part of a great family, and living in a world that offers me so much to see and learn. I also think I am fortunate that I don’t have a lot of expensive material goods to worry about. Anthony and Kathy married. Anthony thought this would be a modern marriage which meant equal roles for equal partners. So, the first morning back from their honeymoon, Anthony brought Kathy breakfast in bed. Kathy wasn’t impressed with his culinary skills, however. She looked disdainfully at the tray, and snorted, "A poached egg? I wanted scrambled!" Undaunted, the next morning, Anthony brought his true love a scrambled egg. Kathy wasn’t having any of it. "Don’t you think I like variety? I wanted poached this morning!" Determined to please Kathy, the next morning he brought his true love two eggs – one scrambled and one poached. "Here, my love… enjoy!" Kathy was furious, "You scrambled the wrong egg!" "How come you’re late?" asked the bartender, as the blonde waitress walked into the bar. "It was awful," she explained. "I was walking down Elm street and there was a terrible accident. A man was thrown from his car and he was lying in the middle of the street. His leg was broken, his skull was fractured, and there was blood everywhere. Thank God I took that first-aid course. "What did you do?" asked the bartender. A couple’s happily married life almost went on the rocks because of the presence in their household of old Aunt Emma. "Darling, if I didn’t love you so much , I don’t think I would of have put up with having your Aunt Emma in our house all those years!" "Huh? My Aunt Emma!?" she cried. "I thought she was *your* Aunt Emma!" She rolled the dice and she landed on ‘Science & Nature.’ Her question was, "If you are in a vacuum and someone calls your name, can you hear it?" "I’ll believe in reincarnation in my next life." A priest was preparing a dying man for his ‘long day’s journey into night’. Whispering firmly, the priest says, "Denounce the devil! Let him know how little you think of his evil." The priest asks, "Why do you refuse to denounce the devil and his evil?" The dying man replies, "Until I know exactly where I’m headed, I don’t think it’s such a good idea to aggravate anybody." Bryant, a youngster about four years old, loved having ice cream after dinner every evening. He would sit on his mother’s lap and have a small bowl for dessert. Unfortunately, he developed the habit of licking the bowl afterwards to "make sure he got it all". This went on for a while, much to his mother’s chagrin. Finally, trying to tactfully hint that it was not such a great idea, she said, "You know, when I was your age, my mother said that licking my dish was a VERY impolite thing to do." Bryant thought a minute, and then responded, "Well you can do it now if you like, because I don’t mind at ALL!" "Isn’t that thoughtful," my husband said to me. "They must have realized that we packed our kitchen stuff." Is it really worth all the stress? These sure aren’t the easy times are they? I was looking into today’s news and with the global economy again softening, an escalating crisis on the Korean peninsula, the plummeting Euro and the disastrous Gulf oil spill it would be easy to let events take us down. And for some a long period of unemployment requires all their strength just to stay upbeat. Yep, it is tough to stay optimistic but the alternative only makes things worse. There has seldom been a better time for us to learn how to rise above our problems than right now. If you don’t know how you might do that you can start by reading this article by Dr. Bernie Kastner a psychotherapist who helps individuals (including college students) take charge of their life so they can achieve more of their goals. Here is an excerpt from what he wrote. * Are you stressed out right now about doing something you hate to do? * Does your life feel off balance? * Are you using procrastination as a defense mechanism? A former professor of mine told me that if you have something unpleasant to do, don’t put it off – it will only get worse. Many of us have "to do" lists that we create for ourselves on any particular day. It is not uncommon for this list to consist of ten or more items. Some of us even prioritize the list either in their order of importance, or in the logistical order in which they would get checked off most efficiently. Rarely are we brave enough to put the unpleasant tasks first. Upon further reflection, why should anyone begin one’s day with something unpleasant? Why not first do something you like, and then do the dirty work? This way you already have something positive under your belt for the day. The concept of first doing something nice is well-documented. Some refer to it as a "spiritual reservoir". This means that every day you build up your spiritual bank account with "feel-good" types of things like giving charity, volunteering, going out of your way to do a favor for a stranger, getting your endorphin levels up by exercising or by just enjoying a good book. Now imagine you are having a bad day, or better yet, you know in advance that you will be facing a tougher day than usual. As long as you know you have a positive balance in your "well-being" account, you simply withdraw a certain point value that you ascribe to the challenge you will be facing, and at the end of the day you still remain with a positive balance on your ledger. Initial feelings of despair and disproportion suddenly fall away. When you see your account getting low, then you know you need to build it up once again. You can understand that if you allow the "state" of your account to go into overdraft, you are starting out from a point of distress and any additional challenges that come along your way will only add to that minus. Think about this reservoir as a protective seal that coats you with a thick layer of positive energy whenever you need it. The account is open 24 hours a day and deposits and withdrawals can be made accordingly. "What Doctors Say, And What They’re Really Thinking"
"This should be taken care of right away." I’d planned a trip to Hawaii next month but this is so easy and profitable that I want to fix it before it cures itself. "Welllllll, what have we here…?" He has no idea and is hoping you’ll give him a clue. "Let me check your medical history." I want to see if you’ve paid your last bill before spending any more time with you. "I’d like to prescribe a new drug." I’m writing a paper and would like to use you for a guinea pig. "If it doesn’t clear up in a week, give me a call." I don’t know what it is. Maybe it will go away by itself. After spending 3-1/2 hours enduring the long lines, surly clerks and insane regulations at the department of motor vehicles, a lady stopped at a toy store to pick up a gift for her son. She brought her selection – a baseball bat to the cash register. "Cash or charge," the clerk asked. "Cash," she snapped. Then apologizing for her rudeness, she explained, " I’ve spent the afternoon at the motor-vehicle bureau. I am way past sane!!" "Shall I gift -wrap the bat?" the clerk asked sweetly, "Or or you going back there?" Anything is possible, unless it’s not. AVOID "WOO-WOO" PRACTICES. Ignore the evidence suggesting that meditation, yoga, deep breathing, and/or mental imaging help to reduce stress. BECOME NOT ONLY A PERFECTIONIST BUT SET IMPOSSIBLY HIGH STANDARDS… …and either beat yourself up, or feel guilty, depressed, discouraged, and/or inadequate when you don’t meet them." When you find yourself stressed, ask yourself one question: Will this matter in 5 years from now? If yes, then do something about the situation. If no, then let it go. All’s well if you think it is! This is a week I have been waiting for. I get to meet my new urologist; my former went and died on me sometime ago. He had wanted to keep chasing an elusive stone and do a cut here and a nip there in an effort to reduce the foundation of my exercise program – frequent use of the facilities. I am doing as well as can be expected so I don’t think I will have to do more than provide a sample and do the annual goodbye until next time trick. The biggie is that I get another brain scan on Wednesday to see if my aneurism has quit growing or if my super head guy wants to take action. I was staying close to the Doctors recently in case it acted up but I have decided it is not worth doing that so unless he discovers something new I am going to stay active, travel when I can, do what I can, communicate with you when I can and have as much fun as I can. After all life is to be enjoyed not lived filled with worry. I have always been glad that I seldom worried until it was too late, for that freed me from being anchored down by thousands of concerns about what might happen that never do. 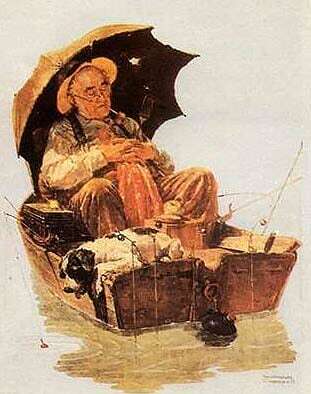 So I am going on, confident that all will be well, and if not I will still have had additional worry free days. If you’re able to worry, you’re also able to be confident. Because from a functional standpoint, worry and confidence are pretty much the same thing. Worry is the expectation that something negative will happen. Confidence is the expectation that something positive will happen. How do you create confidence about something that hasn’t happened yet? You use the exact same process you would use to create worry. The big difference between worry and confidence is the expected outcome. And the powerful fact is, you can expect whatever outcome you choose. There’s another way that worry and confidence are quite similar. They both tend to be self-fulfilling prophesies. So instead of destroying your effectiveness with worry, you can vastly enhance your effectiveness with confidence. It takes nothing more than a simple yet powerful change in your expectations. Two priests died at the same time and met Saint Peter at the Pearly Gates. St. Peter said, "I’d like to get you guys in now, but our computer’s down. You’ll have to go back to Earth for about a week, but you can’t go back as priests. What’ll it be?" The first priest says, "I’ve always wanted to be an eagle, soaring above the Rocky Mountains." "So be it," says St. Peter, and off flies the first priest. The second priest mulls this over for a moment and asks, "Will any of this week ‘count’, St. Peter?" "No, I told you the computer’s down. There’s no way we can keep track of what you’re doing." "In that case," says the second priest, "I’ve always wanted to be a stud." "So be it" says St. Peter, and the second priest disappears. A week goes by, the computer is fixed, and the Lord tells St. Peter to recall the two priests. "Will you have any trouble locating them, He asks.?" "The first one should be easy," says St. Peter. "He’s somewhere over the Rockies, flying with the eagles. But the second one could prove to be more difficult." "Why?" asketh the Lord. "He’s on a snow tire, somewhere in North Dakota." The day after the ad appeared, a heavy man of about 70 appeared in the offices of the fitness club. "I’m here about the ad," he said. Be the living expression of God’s kindness: kindness in your face, kindness in your eyes, kindness in your smile." I have a friend named Jo Ann who spreads joy through her kindness wherever she goes. I think there is a very special place waiting for Jo Ann and those like her who practice kindness every day. I have had the good fortune, especially in recent years, to meet and work with the truly kind. These are people who care about others; they are never quick to judge, ridicule or demean anyone. I love the way that they have learned never to let anger take control of their emotions or actions. It seems that they go out of their way to express sincere interest in everyone they meet. They share your joy and feel your pain and always act unselfishly. What I especially envy is the delight they get from doing something for others without worrying about themselves. You and I start each day anew, each morning we go through our get ready ritual. We shower, shave, eat, maybe have a cup of coffee and then get on with the day. Many of us will dress to cover our flaws, other to conform to current norms and still others of us will don special dress to prepare for the role they want to play that day. I believe we also can don an attitude of kindness and friendly demeanor as well. I find that when we do we thrive as players making the day a little better for all we meet. There are no better days than those that include the gift of kindness to others. And oh yes, always remember it is often the small acts that make the greatest differences. Here is a case in point. The year was 1996. Mary walked into the hospital room carrying a large stuffed panda bear. She was there to visit my little friend Ben, her 7 year old bother, who was recovering from a head injury. For a long while Ben had shown little emotion. But now his eyes lit up as Mary said, "Hey little man, look what I’ve got for you!" Ben began to smile that day as he hugged his new panda and talked with his sister. Ben’s parents, grandparents, aunts, and uncles came. His school teacher and friends often visited him. Ben had much assurance that his friends and family loved him and wanted him to get well. Ben eventually made a full recovery. The kindness and caring of all the people in his life made an enormous positive difference. When we take time to touch shoulders with another person, whether it’s with words or actions, it makes a difference. Our presence and appropriately caring words help others tremendously during times of loss, difficult transitions and healing. Small acts of kindness speak in loud voices. They say "I care, I am concerned, I respect you as a person, and I want to share joy with you!" Today, give someone a smile with a small expression of kindness. You will create two smiles – one for the other person and one for you. My boss’ wife Sherry was exasperated with her younger sister, who bought an unreliable car and called for a ride every time it broke down. One day Sherry got yet another one of those calls. "What happened this time?" she asked. "Where are you?" Sherry asked. "I’m in the drugstore," her sister responded. "It’s in here with me." Sorry gang, I did it again. I ended up with early morning meetings followed by volunteer work on a new community garden. I then was asked to help resolve a neighborhood problem and I am about to start cooking dinner with no Daily. So we go back to the past once again. I worked over the weekend at the Indianapolis Motor Speedway with a fellow Salvation Army volunteer. She is a decade or two younger than I am yet we found we had much in common. Some of our conversation centered on the youth that will soon manage our world and our lives. We wondered if the pressures and materialism faced by many results in their being too narrowly focused to be able to deal with the broader responsibility of governing our society. Have they time for the humanities? Have they been sold on the idea that all politics is bad? Are they convinced that there is nothing anyone can do? I hope the answer is no to all of these, at least for our very best and brightest. Find your own happiness. It amazes me how many of us don’t stop long enough to analyze what gives us pleasure. Too often we let others decide where we should look for happiness. I suggest that if you like to read then read. If you like to travel then travel. And if you want to see what you might be missing, get involved. Stray from the path once in awhile. Many of us reach the starting line in our lives and always follow the course laid out by others. Almost always you will find that it is those who stray from the beaten path who contribute the most to building a better world. Don’t run too fast. I pity those who run so fast that they never see anything around them. Sadly when they get to the finish line they find the race is over and their lives have ended. Everyone is a resource that should be used and not wasted, stop once in awhile and regroup for it is often the new beginning that allows us to be all we might be. Let go! Don’t let the past define our future. Some will say that doing it the same way we always did provides us proven results, don’t kid yourself too often this just provides us the excuse to coast with what we have. Those who stay in the past stagnate, and they become the past, as the one thing you can be sure off the world is always changing whether we do or not. There is a lot more I could say but I won’t. The bottom line is that if our leaders of tomorrow don’t know themselves, don’t take a risk once in awhile, don’t stop to see if there is a better way, and lock them selves into the past because it is a safe harbor, then my friends I fear that my golden years will not be as bright if those who will have the power to manage society let us down. The way people in democracies think of the government as something different from themselves is a real handicap. "Mama, I got married." "Mazel Tov," says Mama. "I might as well tell you, Mama, he’s not of our Faith." "So he’s a goy. But am I prejudiced?" "But, Mama, he’s also black." "So he’s a schvartzeh. By me, everybody should be tolerant." "Well, frankly, Mama, he’s also unemployed." "So, you’ll support him. A wife should help her husband." "But, Mama, we have no place to live." "Don’t worry, Selma, dear. You’ll move in with us." "But Mama, you have only one bedroom." "That’s okay. You and your husband can have the bedroom." "Yes, Mama, but where will you and Papa sleep?" "Papa can sleep on the couch in the living room." "Yes, Mama, but where will *you* sleep?" "Selma, dear, about me you don’t need to worry. The minute I get off the phone…I’m going to drop dead." Nadine and Jill got summer jobs as cashiers in a grocery store. Nadine is ringing up an order on her line and comes to a small dairy carton that isn’t scanning and has no price on it. She yells out to Jill, "How much is half-and-half?" Without a moment’s hesitation Jill replied, "One." 1. SICKNESS: No excuses will be acceptable. We will no longer accept your doctor’s statement as proof of illness, as we believe that if you are able to go to the doctor, you are able to come to work. 2. LEAVE OF ABSENCE FOR AN OPERATION: We are no longer allowing this practice. We wish to discourage any thoughts that you may not need all of whatever you have, and you should not consider having anything removed. We hired you as you are, and to have anything removed certainly makes you less than we bargained for. 3. DEATH, OTHER THAN YOUR OWN: This is no excuse. If you can arrange for funeral services to be held late in the afternoon, however, we can let you off an hour early, provided all your work is up to date. 5. PERSONAL HYGIENE: Entirely too much time is being spent in the washrooms. In the future, you will follow the practice of going in alphabetical order, for instance, those with last names beginning with "A" will be allowed to go from 9:00-9:05, and so on. If you are unable to go at your appointed time, it will be necessary to wait until the next day when your time comes around again. 6. QUANTITY OF WORK: No matter how much you do, you’ll never do enough. 8. ADVICE FROM OWNER: Eat a live toad the first thing in the morning and nothing worse will happen to you the rest of the day. "I know," said the man, "but if there is anyone here more bored than I am, then I’d like to meet him." In an American history discussion group, the professor was trying to explain how societies ideal of beauty changes with time. "For example, he said, "take the 1921 Miss America. She stood five feet one inch tall, weighed 108 pounds and had measurements of 30-25-32. How do you think she’d do in today’s version of the contest?" "For one thing," the student said, "She’d be way too old."